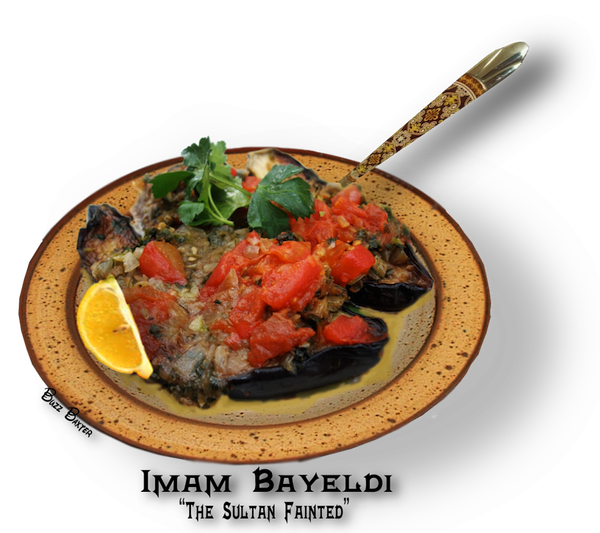 An Ottoman (Turkish) dish of a roasted eggplant filled with ratatouille. A Turkish favorite and one that vistors to Turkey will remember. pieces of eggplant to the other vegetables and fill the shells with the vegetable ratatouille. tomatoes, basil, mint and parsley and saute for a few minutes more. 5. Remove, cool to room temperature. Served warm or at room temperature. I like to drizzle extra virgin olive oil over the top just before serving. It gives the eggplant a rich flavor. THOUGH THEY ARE NOT IN ENGLISH. THE EGGPLANT IS FRIED INSTEAD OF BAKED.